Once upon a time there was a school situated in the middle of a very big city and surrounded by very busy roads. The children would often run out of school and start playing, not realising how dangerous it was to have a road so close by. There had already been accidents when children crossed the road without looking, or when they ran around near the traffic lights. He thought this would be a very good idea, so he told his friend the zebra crossing. 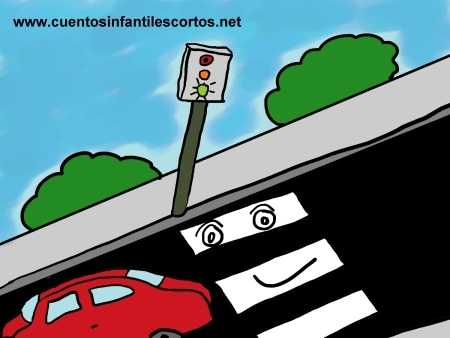 But the zebra crossing said: “If we do that, we will only cause children in a different neighbourhood to have an accident, because they will rely on us to save them. But we won’t be there!” The traffic light thought this through, and realised that the zebra crossing was right. Once they understood that it had to be the children themselves who acted sensibly, they told all other traffic lights and pedestrian crossings, and then these told others and so on and so forth until all the traffic lights and pedestrian crossings in the city knew. And after three months, all the children in all the schools were very careful when they went out onto the street, and there was never an accident in the city again. The traffic light and the zebra crossing had made the children realise how dangerous roads can be, and they were delighted to have taught them to follow the basic rules of road safety.